Buy this book at Amazon, Barnes and Noble, or IndieBound. Some of the brightest minds in science have passed through the halls of the California Institute of Technology. In the early 1980s, Leonard Mlodinow joined their ranks to begin a postdoctoral fellowship. Afraid he was not smart enough to be there, despite his groundbreaking Ph.D. thesis, he took his insecurities to Richard Feynman, Caltech’s intimidating resident genius and iconoclast. So began a pivotal year in a young man’s life. Though a series of fascinating exchanges, Mlodinow and Feynman delve into the nature of science, creativity, love mathematics, happiness, God, art, pleasures and ambition, producing a moving portrait of a friendship and an affecting account of Feynman’s final creative years. In the time since Mlodinow met him, Feynman, the late Nobel laureate, has been virtually canonized as the People's Physicist-an earthy, bongo-playing free spirit who delighted in puncturing the pomposity of the establishment. In this memoir, the aging physicist still cracks wise, crashes parties, works on his physics at a strip joint and needles stuffed-shirt academics. And Mlodinow was something of a Feynman-esque character himself-he liked to smoke pot with the garbage man next door and was working on a screenplay when he turned to the older scientist for life lessons. 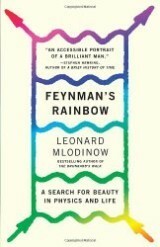 Mlodinow's accessible style conveys Feynman's cantankerous appeal as well as some of the weirdness of theoretical physics without overtaxing lay readers, while his deft, funny, novelistic portraits of its practitioners, like the toweringly pretentious and touchingly human Nobelist Murray Gell-Mann, bring this seemingly gray sub-culture to vivid life. Young scientists will find solace and perhaps inspiration here. The tribute to the man is set against an amusing, nicely drawn backdrop of campus life, and fleshed out with a very readable account of string theory, which developed into the most promising breakthrough of the century in theoretical physics. It is a sweetly entertaining and exhilarating book that reflects the radiance of its subject and warms as it instructs.